Less than 2 weeks before leaving for Europe, we went on a wonderful camping weekend trip with dear, old friends to NE Iowa. It was very late on Sunday night when we arrived home and I was still trying to unpack when Josh insisted I take a shower and scrub off. Even though I hadn't showered in 3 days, I just wanted to finish cleaning and fall into bed. But I listened to Josh and got into the shower and scrubbed. While I was scrubbing I noticed a very small "mole" I had never seen before on my upper thigh. Then I thought it was dirt, so I scrubbed some more. Then I saw that it had legs. It was a deer tick. I quickly yet calmly pulled it out with my fingernails (which I now know is a no-no) but as soon as it started to walk across the top of my fingernail I SCREAMED! Josh came running, confirmed it was a deer tick, and due to my screaming/freak-out, he flushed it down the toilet per my request. I had Josh search the rest of me and then sopping wet I proceeded to wake up each of the kids, strip them down and check them for ticks while Josh researched just what this meant - getting bit by a deer tick. I was glad that he was doing the research because prior to this I had only known friends who had gone through the horror stories of Lyme Disease. The first thing he read was that you are suppossed to keep the tick. Doh, Dana! The sites all agreed that symptoms would not show up for 1-2 weeks, right around the time we were going to be leaving the country. We decided to wait a day, talk to our doctor, and keep an eye on it. Within 48 hours both my doctor & Josh agreed that being preemptive and putting me on the antibiotic Doxycycline for 14 days would be best. The medicine has great results at treating Lyme Disease but it also has all these strange dietary requirements and side effects, one of which being sun sensitivity. I tried to stay in the shade, or inside, keep 85 spf on me, but I never thought to cover my hands with sunscreen. Welp, I ended up with a severe toxic reaction on the top of my hands. They literally felt like they were on fire, burning fire, cannot be stopped fire, intense and constant fire that was not going away even after many days. Thankfully, before we left for Europe a friend recommended Burt's Bees Res-Q Ointment. While it didn't cure the intense pain, it was nice to have on my burns and knowing it was all natural, I knew (well, hoped) the ointment wouldn't make it worse. In all honesty, this whole ordeal was a blessing in disguise. Prior to this, I had never seen or removed a tick. Being that ticks were the one thing people worry about at English camp in Strakonice, and I now had full and calm knowledge of ticks and Lyme Disease. This made for a lot more relaxed mama at camp! Also, since I had the burns I had the Res-Q Ointment on hand in Czech. When Max ended up with his entire body covered in hives (as a reaction to a type of grass in Czech) the Res-Q Ointment was the prefect treatment to stop the inflammation of his hives. Really, a blessing in disguise! If you find a tick DO NOT twist, use a match, cover with nail polish, cigarette, etc the tick. 1.) DO grab a pair of tweezers, plastic baggie and antiseptic/soap. 2.) Carefully position the tweezers close to the skin (without touching) and gently place the tweezers on/toward/near the tick's head. 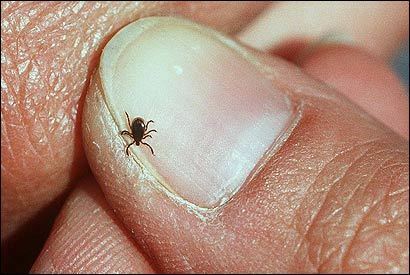 Gently/steadily pull up, making sure not to squeeze the tick's body, which would cause bacteria to enter into the person/animal the tick is biting. 4.) Look to make sure you have removed the entire head of the tick. If you are concerned or don't think you got it all, seek help from a physician. 6.) Wash the area with soap (antiseptic) and water. Moving to Missouri, we have found that ticks are very very common around here. We aren't necessarily as careful as you very nicely explained on how to remove them...I guess that I should. We tend to pull some off each week around here unfortunately so we are a little beyond freak out! Yeah, it does matter what state you are in and what type of tick it is. 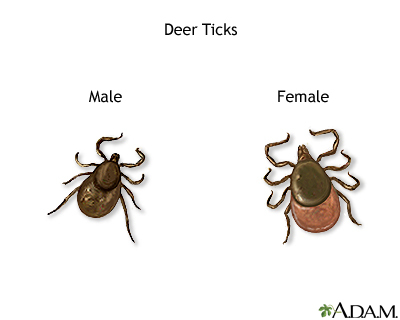 The further north you go the chances of Lyme Disease via a deer tick get greater. If you are on the northeast coast it is almost certain. Then in the Rockies they have some other type of disease from a specific type of tick. Crazy things! OY!